When we mention the Civil War in North Dakota, most people say, “What! ?” North Dakota is so far from the area we associate with the Civil War. Were there Confederate troops here? The answer is “no.” However, events did warrant sending resources - men, equipment, and supplies - to the frontier as conflicts between Dakota tribes and Euro-American settlers became more frequent. The Dakota War of 1862 by Kenneth Carley, The Dakota War by Micheal Clodfelter, Brackett’s Battalion by Kurt Bergemann, Columns of Vengeance by Paul Beck, and Through Dakota Eyes edited by Clayton Anderson and Alan Woolworth give insight into the Civil War-era conflicts that occurred on the Northern Plains between 1862 and 1864. There are five Civil War Battlefields in North Dakota, as defined by the Civil War Sites Advisory Commission established by Congress in 1990. They are Big Mound near Tappen, Dead Buffalo Lake near Dawson, Stoney Lake near Driscoll, Whitestone Hill near Kulm and Edgeley, and Killdeer Mountain at Killdeer. The State Historical Society owns portions of Big Mound, Whitestone Hill, and Killdeer Mountain, while the others are privately owned. Other sites in the state associated with Civil War-era conflicts include Fort Abercrombie south of Fargo, Fort Dilts near Bowman, and the Badlands south of Medora along the Custer Trail, which is managed by the US Forest Service. Since 2012, a group of partners (including the SHSND) have been commemorating the 150th anniversaries of the events that took place at these locations. 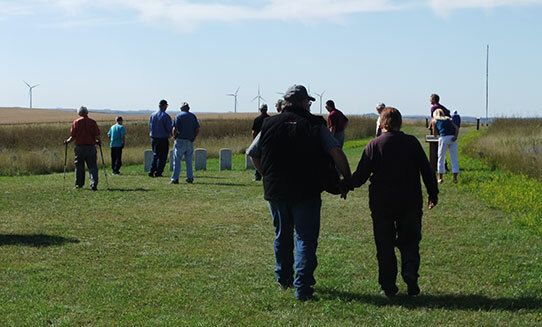 In 2014 there were three commemorative events – Killdeer Mountain, Battle of the Badlands, and Fort Dilts, plus an overview of these events held here at the Heritage Center in June 2014. As we came upon the 150th anniversaries of these events, we received several phone calls and e-mails from people inquiring about our plans to “celebrate” these anniversaries. The word “celebrate” conjures up images of joyful exuberance. We felt that these anniversaries need to be remembered, but the word “celebrate” seems to be disrespectful to the soldiers and Native Americans who lost their lives defending their ways of life. “Commemorate” seemed to be the better choice to appropriately describe the anniversaries and gave us direction for planning. Each community near these historic sites wanted to be involved in planning. Native Americans who have family stories about the conflicts were also eager to take part. This involves the Ocheti Sakowin or the Seven Council Fires of the Dakota; the Eastern or Dakota groups of Mdewakanton, Wahpekute, Wahpeton and Sisseton, the Middle groups of Yankton and Yanktonai, and the Western or Teton which include the Brule, Hunkpapa, Oglala, Two Kettles, Sans Arc, Minneconjou, and the Sihasapa or Blackfeet. On paper, this event planning sounds so easy. Just call everyone and set a meeting date, right? To be inclusive and get the full story, everyone has to be at the table. The members of the Ocheti Sakowin live in Minnesota, Nebraska, South Dakota, North Dakota, and Montana. There is no one spokesperson for the groups. And even now, 150 years later, emotions still run high about this era of history. Add in the pressures local communities are feeling with traffic and increased population in the western part of the state and you have some interesting (and enlightening) conversations. The US soldiers involved came from Minnesota, Nebraska, and Iowa, and military reports were used to tell that part of the story. The commemoration events were quite successful. Those involved in the planning process were aware that the events had to be inclusive. In the three years of dialogue and planning for these commemorations, trust between all parties developed so that any concerns could be brought to the table and resolved. The three sites that observed anniversaries this year are small in size. It’s difficult to get a large number of people on these sites, as there are no facilities such as restrooms or water. The events were hosted by the Dunn County Museum in Dunn Center, the City of Medora, and the Pioneer Trails Regional Museum in Bowman. Bus tours to the sites got all interested visitors to the right places. Feedback from attendees suggests that they learned something about that historic site next door. 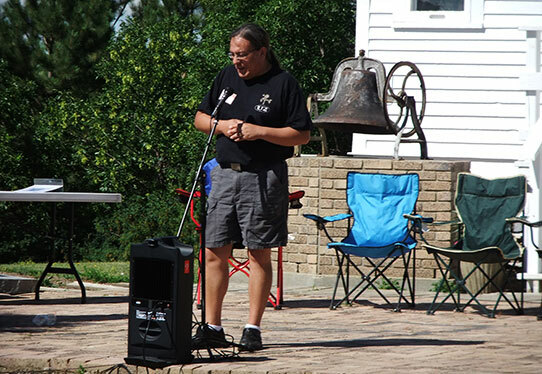 These events, and particularly the inclusion of Native American perspectives on this chapter of North Dakota history, seemed to help people realize that there are multiple and complicated stories associated with the sites that go beyond the historic site marker text. Our goal is to continue the conversations and research to bring a more balanced and culturally inclusive interpretation of this period of history to site visitors. Diane worked with state historic site staff and local community groups as a former historic sites manager.